With 88 minutes gone, the Lurgan Blues were down and out before a thrilling fightback featured Stephen Murray’s equaliser then a last-gasp Sammy Clingan penalty kick to complete a 2-1 turnaround. Coleraine boss Rodney McAree. Pic by Pacemaker. It marked the perfect start to the Danske Bank Premiership post-split programme as Glenavon now sit just a single point behind the Crues in contention for a third-place finish. Coleraine will provide the weekend test at Mourneview Park for Hamilton and the Glenavon manager cites increased confidence from the circumstances behind the Crusaders result alongside a four-game haul of maximum points. “The split gives you a challenge each week against teams around or above you, so it demands a real team effort otherwise you simply cannot expect to win games at this point of the season,” said Hamilton. “Even on the sidelines on Saturday I always felt we would get something from the game, certainly score a goal. “Over the past few games you can see us produce, not just as individuals but as a team, with that never-say-die attitude. Off-the-field preparations for the Crues game were disrupted by Paul Millar’s midweek exit as assistant manager - with Hamilton immediately turning internally to promote Andy Mathieson alongside bringing Kyle Neill back to the club. “I had a close friendship and working relationship with Paul on and off the field and it is not about replacing a character like that but I wanted to bring in people I could trust and respect,” said Hamilton. “We want to develop a pathway across the club of not just players but coaching staff, so someone like Andy is a familiar face around the first-team players. “Kyle has also enjoyed a wonderful career, including his successful time as a Glenavon player, so will add an important voice to the changing room. 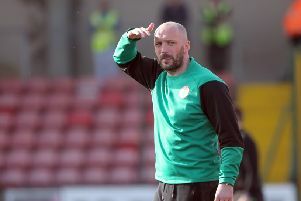 Bannsiders boss Rodney McAree is aiming to improve on a Coleraine return of a single point from this season’s three previous meetings with Glenavon. “Hopefully we can put that right,” said McAree. “We won’t dwell on previous results against Glenavon. “We have to try and win all of our games before the play-off. “We have four games left before the European play-offs and I’ll take great confidence from how we played going forward. “We have to make sure we get bodies back so we have as many bodies available as possible. “If we keep turning in performances going forward and tighten up at the back, I think we will give ourselves a chance.